OK, so the label’s not from the right year, but I wasn’t allowed to finish the bottle! 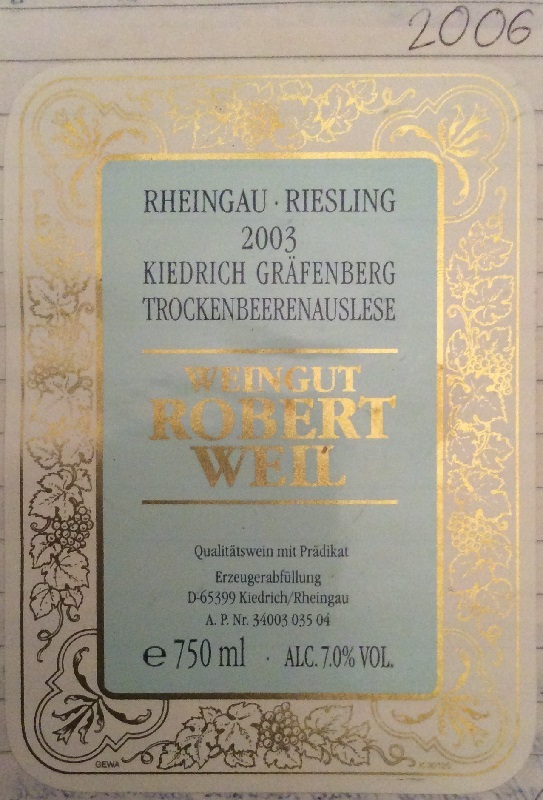 Having said that, the 2003 scored 100 points in Germany’s pre-eminent wine guide, Gault-Millau, and the 2005 got 19.5 / 20 from Jancis Robinson. So I got (extremely) lucky when I visited the winery in the afternoon after stage 1 of Sven’s wedding… it turned out that they’d had an event a couple of days earlier and had some leftovers (! ), so I tasted 9 or 10 wines, including the Beerenauslese (€249 / 75cl) and this (€511.70!). I figured this merited a note as my first TBA. Burnished gold – deep & thick – clearly viscous and comfortably more so than the 135 g/L BA. Smoky, tarry nose then membrillo quince complexity in just the first whiff! Paprika and cinnamon spice – sharp, pungent. Then cream emerges subtly, with some raisin fruit. Lime pickle (!) like at a curry house. Weird and very wonderful. Unctuous palate, but the balancing acidity is there – like caramel cream stirred into apricot & orange marmalade. Very persistent. Not a 100-pointer, but how will this turn out! ?